The best beauty tricks might not always be modern inventions. Grandma's beauty tips are useful even today, bringing some vintage wisdom to our beauty habits. For beautiful shiny hair and healthy glowing complexion, old-fashioned beauty tips shouldn't be tossed aside just because they are old. Easy, inexpensive, and natural, these tips stand the test of time and actually work! Rinsing with cold water after washing your hair is an easy tip to add some extra gloss and shine to your tresses. Just turn the thermostat as cold as you can get for a minute at the end of your shower and rinse your hair throughly. This will help the hair cuticles to close and make your hair smooth and shiny. Another one of grandma's crazy beauty tips is to rinse hair with beer. There is actually some truth behind this: beer contains B vitamins and proteins that help make the hair shiny and bouncy. Try to use the best quality beer possible. Warm the beer to room temperature and use it as a rinse after shampoo and conditioner. Massage the beer onto your scalp as well and let it stand for a while, then rinse well with water. Do you have puffy and tired eyes? Classic cucumber slices are a great way to battle puffiness. 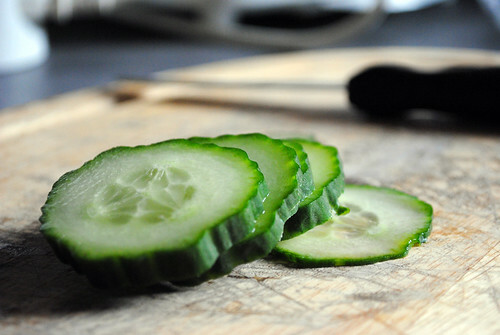 The cool and light cucumber slices will reduce swelling and calm the skin. Sweating inside a steamy sauna might not seem like beauty tip, but grandma knew that the relaxing and calming heat is beneficial to your skin by increasing your blood flow. The key is to step outside after a while, take a break, and go back inside. The temperature changes will boost circulation, help you shed toxins from your body, and put that healthy blush on your face.